The interview everyone clamored for but hadn’t been holding their breath waiting for has come to pass. 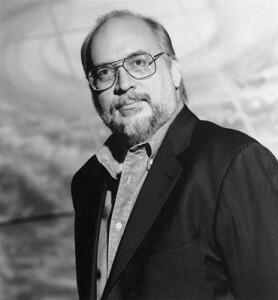 Interview: J. Michael Straczynski, The Great Maker, graciously allows Tim and Summer to throw a seemingly endless stream of questions about the origins and creation of Babylon 5, the production and growing pains of the show, and dealing with the vagaries of the industry of Hollywood, the bizarre perfect storm surrounding Crusade on TNT, and more. And yes, this interview went long enough that the only way to do it justice was to split it over two episodes, so come back next week for part 2! You have until June 27th to enter the contest to win a free iTunes copy of the Harlan Ellison documentary Dreams with Sharp Teeth! 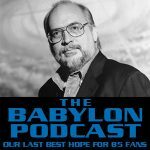 Babylon 5 Information Gathering: If you know of a dead or abandoned B5 related website that may be in need of a new home, let Summer know! Maybe we can mirror it here or house it on a sister site. If you can, Please Donate! Thank you. So very much. Especially for posting the podcast already. iTunes was fast and I am listening to it right now. After jms declined to appear before, I had given up hopes to ever hear his voice on the podcast. It’s nice to see that if you have faith, things do work out. Thanks for the interview, and thanks to jms for taking time out of his schedule for the podcast. I entered into this with great trepidation. He could have used these two hours to do more work on the Lensman script. I was relieved to hear the second draft was completed. @ Tim: since you dived right in with the interview, could you elaborate a little on how you and Summer learned that you’d have the chance to do the interview? Did jms approach you? Did Jeffrey set this up? How was your first reaction when you realized you’d actually get to interview the Great Maker? Did you and Summer prepare for this interview a) at all or b) if yes, differently than for other interviews? Actually, JMS contacted Summer and said, “It’s time.” We sat on this for nearly four weeks – that was the hardest thing, trying to keep this quiet from all our listeners! There was lots of squeeeing via email for about a day or so. We did much more preparation for this interview than previous ones. Our biggest goals were to avoid the obvious (e.g., Claudia Christian) and find fresh angles (e.g. Crusade). We also gave thought regarding topics that have never really been explored, like the Paramount angle. Which, now I think about, might be in Part II. I don’t know where Mike split the interview; I haven’t listened to the episode yet. So there’s a teaser for ya! Well, in #162 or #163 you should discuss more about the behind the scenes. I’m looking forward to hearing these. I enjoyed hearing new questions posed to jms, as well as how forthcoming he was with talk about Paramount and Michael O’Hare. This is really exciting. Like Gary, I also thought that we would never get an interview with JMS. And I did buy his reason for not doing it, leaving the podcast as a place for other people speak up. Great interview. I really like the questions that you guys are asking and how forthcoming JMS has been in answering them. You’re not wasting time on trivial stuff, which is great. You guys sat on this for close to 4 weeks. I’m impressed. That must have been difficult. Really looking forward to part 2 of the interview. This certainly tops getting an email of mine read on the podcast. I’ve enjoyed all the prior interviews as they were all enjoyable and enlightening. However, this was the best interview I’ve heard on the show. I don’t know how this can be topped so it’s probably all downhill from here. Lame jokes aside, enjoy the time off and I’m hoping for some more gems. Guess what just filtered to the top of my playlist! AWESOME interview! I was wowed to see JMS was part of the Babylon Podcast this week and really eager to listen to the entire thing. Can’t wait until next week to hear more. I really have to say a big thanks to JMS. Also have to thank the Babcasters for not telling us in advance. This was truly an amazing surprise when I found out. As a writer, I can’t get enough of great writers and creators like JMS. Thanks again! And with my favourite scriptwriter…. *sighs*. I am beyond jealous! I couldn’t resist anymore and downloaded it to listen at lunch and beyond (as opposed to in the car as I usually do so). 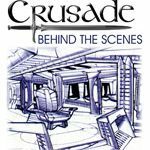 Just heard the beginning of the Crusade bit with his words about his plan for the end of first season of Crusade. Wow! Thanks for this great interview. Thank the Great Maker for thinking ‘it’s time’. It shows he’s listening to the podcast too. Ever since I got my new iPhone with the ability to play at double speed I have been zooming through podcasts (except music ones), but when I heard what this was, I zipped back to the beginning and played at regular speed. I will be listening to this again and again. Oh, what a joy! Thank you so much for making my day! Yeeeeeeeehaaaaaaaa! Wow. Just starting to download. Faith indeed manages :-). This was an awesome interview! Thanks guys! Next week why aren’t you already here, want to hear the rest of that awesome interview. Stunned. No build up, no teasing, no promo. Why JMS? Why now? He is a mystery. And I am both terrified and reassured to know that there are still wonders in the universe – that he has not yet explained everything. Why now? It was time. The universe does not offer such chances often! Why now? Why not earlier? All this time, where have you been? I have always been here. 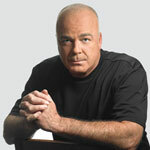 JMS on the Babylon Podcast. The First Ones have returned. It was indeed a huge surprise to suddenly see JMS on the page. At first I ofcourse suspected some Gary trickery, but thankfully it wasnt. Great job everybody. Im quite impressed that you didnt have a total geek-breakdown. I know I would. Looking forward to the next part!